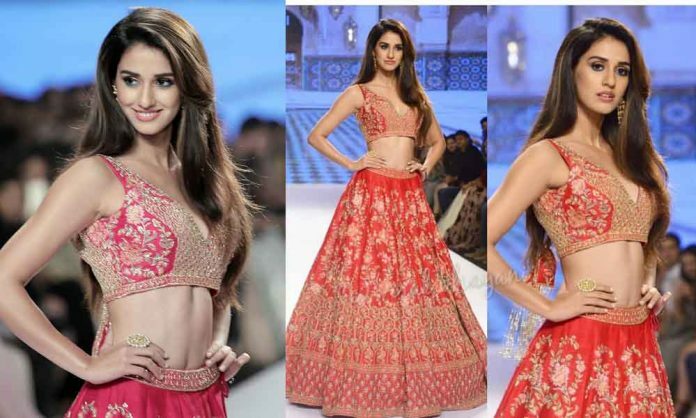 Disha Patani left the audience spellbound as she walked the ramp as the showstopper for Kalki Fashion at a recent fashion week. Disha looked elegant and alluring as she donnined a signature piece, in melon pink lehenga with layered embroideries in vintage English colors embellished with gold metal yarns, and resham. The actress stole the show with her effortless beauty and looked breathtaking in this traditional attire. Taking to her instagram, the actress shared, “@kalkifashion 🌸🌸 #KALKIxDishaPatani #KALKIAthenaThank you @kalkifashion for the show! In love with this melon pink lehenga😍 What a graceful collection!Had a great time 🌸#kalkishowstopper #Showtime” , “@kalkifashion absolutely loved being your muse and showstopper for the incredible KALKI Athena collection 💕#KALKIxDishaPatani #kalkifashion #kalkiathena” adding to it. After the back to back success of M.S. Dhoni and Baaghi 2, which raked more than 100 crores at the box office, Disha Patani will be next seen in the upcoming film Bharat along with Salman Khan.The actress plays the character of a trapeze artist in Ali Abbas Zafar’s directorial.